Small waves on Eagle Lake allowed me to catch a Northern and enjoy the fish fry on a flat rock on its northern shore. Pushing off towards the Talon River and it prominent WCPP sign a tailwind did most of the work while I enjoyed a mug of coffee. Once on the Talon River it was evident that it was back to high water levels. The first 30-meter portage above Eagle could have been lined with a tandem canoe but was not worth the chance of filling my solo with water. The timber all the way to the southern tip of Talon Lake is really old. It has kept the portage crews busy with a lot of big trees having been cut off the trail. As I neared Talon Lake the skies cleared and the temperature rose. Cooling dips in the river allowed me to pleasantly get through the portages. Camp was set up on Talon Lake with the tent fly left off until distant thunder convinced me to put it on. It is so hot and humid that a baggy protects my journal from the sweat dripping from my hands. My alarm clock on Monday morning was a calling Olive-sided Flycatcher. Its strong “Quick three beers” call is quite distinctive. Thunderstorms rolled in last night and hammered the lake for 3 hours. The camp was nearly packed up and breakfast ready to eat when another approaching cell required a quick tarp erection. Everything is sealed against the water but it is nicer to keep the gear and myself dry when possible. The best part about the storm cells is the cool air that moves in and the clouds that block the sun. It is a very refreshing thing on a hot and muggy morning like this one. Every time I prepared to leave another shower or thunderclap kept me under the rain tarp reading my bible. Finally at 11:30 it passed and the paddle north on Talon got started. Eagle Lake had a lot of possible camp spots and Talon did too. A canoe had passed my camp the second day on Crystal and my second canoe group was camped on the north end of Talon Lake. Today’s route takes me through Boomerang Lake to Dragon Lake. It has a corridor of old timber with a lot of the big Jack Pine having been blown over. Birch, Aspen and Spruce are prominent with a lush under story of brush. Wildlife should be abundant but my tailwind is carrying my scent ahead of me. It has been a very lazy day with a shore lunch of Northern not taking place until 3:00 PM. Boomerang Lake is too intriguing to rush by. 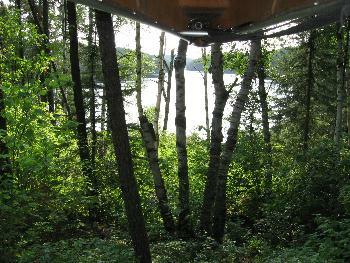 My lunch spot is a great spot to camp with places for numerous tents under the canopy of huge Jack Pine. 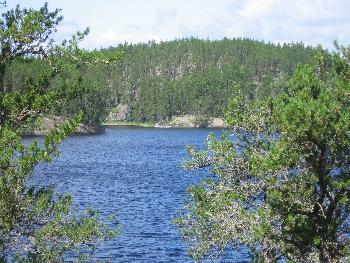 It has great viewing up and down the lake and a lot of open rock exposure for the breeze to keep the bugs at bay. Heading on toward Dragon there were no other camp spots. 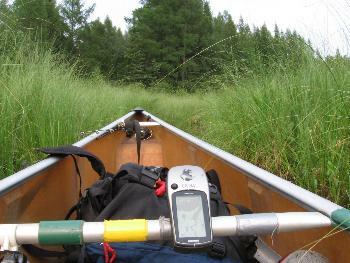 The stream to the portage to Dragon is so narrow it is easiest to pull the canoe from the bank. Some corners need to be pried around so you might as well walk it. A GPS with topo maps loaded really takes the guesswork out of creek stretches like this. I had the added advantage of having done a daytrip through here on an earlier trip. At that time the exact location of the portage was recorded and allowed me to not have to worry about missing the portage. When you get to the portage to Dragon it is a big tunnel through the trees and cannot be missed if you are paying any attention at all. 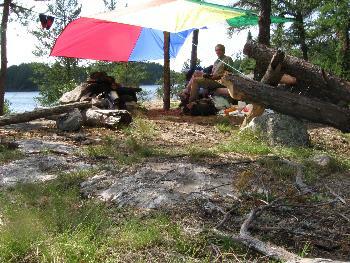 On the opposite side of the lake from the portage there was an excellent campsite. It took one more soak in the lake at bedtime to cool my body down but it produced the first good nights sleep of the trip. Looking around the lake in the morning it reminded me of how stunning it was in the fall as we passed through on a day trip loop from Middle Kilburn to Talon. As on Boomerang there are a lot of Birch and Aspen to turn the lakes into a fall color extravaganza. With all the underbrush there is that much more color. On the lakes with only Jack Pine the fall colors are a non-event. 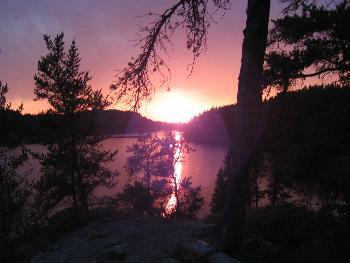 Getting right to sleep last night allowed me to get an early start on the 700-meter portage on the route to Paull Lake. The temps were still OK when I decided that an island campsite on Paull that we had used on the earlier trip would be a great place to layover a few nights. It sits 7 meters over the water on a small island. Normally islands are off limits in my travels because of the Caribou using them to raise their young but this island is a small one among many and is well known and well used as a campsite. My arrival at lunchtime worked out well. The heat had become oppressive also, so it was an even better decision to take a good break here. My wife’s latest text message called for rain tomorrow and a breaking of the heat wave. It will be great if it works out that way. I need some time sitting around a great camp with excellent views of the lake. What better way than from under a sturdy tarp on a rainy day. Actually, the tarp went up right after lunch to provide some relief from the blazing sun. My little thermometer is reading 95 degrees, soon to be 97 in the shade. Ah! Sweet relief, sometime in the early chapters of First Samuel a solid cloudbank with distant thunder blocked out the hot sun. A scurry of activity ensued. Rice and beans were put to boiling; it sure did not take long for the water to reach the boiling point. The sun tarp was rolled up to protect it from damage in what could be a major blow as the cold front arrived. The beans cooked and were enjoyed under a cloudy sky at eighty-five degrees, oh what a difference! The weather is stable on my island at 7:00 PM so the pudding dessert is put off to be enjoyed a little later. At 8:00 my island is still stable but the fire bombers are busy several miles south of me. The smoke of the lightning caused fire rises high in the air as the crews continue the battle until near dark. I have plotted my escape route in case I smell smoke in the night. The clouds have thinned to the west and the skies are red so no big rain is on the way to help the fire fighters. The smoke and the planes are gone before darkness sets in and I head to bed in a more peaceful mood. How nice a layover day is after a week of breaking camp, paddling and portaging. First on the agenda is to roll over and sleep as long as you can. Passing distant thunder and light rain make that an easy one. During a break in the rain the tarp goes up and the coffee started. Another hour slips by while sipping the coffee and listening to the wind in the trees. Finally, late in the morning some breakfast is cooked. How time flies when you are having fun. The wind is cool enough for a jacket but after yesterday’s heat I refuse to put one on. Breaks in the fast moving clouds allow the sun to shine through and its warmth feels good today. Hopefully the winds roiling the lake will weaken and a Lake trout can be procured for supper. The white caps on the water right now would make that a tough job. 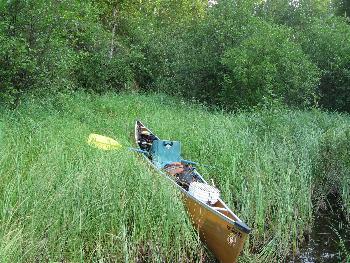 The two canoes that I saw on Talon fight the winds to fish the lake but I spend the whole day lounging atop my island. At bedtime the winds have abated some and the skies have cleared as my rest day comes to a close.